Hortus Camdenensis | Ixia scillaris L.
Cormous perennial with up to 7 lance-shaped leaves, sometimes with undulate margins, and a lax spike, to 50cm, bearing up to 25, scented, white, mauve, pink or magenta flowers, usually with a small green mark in the centre, from winter to spring. [RHSD, CECB]. Ixia scillaris var. latifolia has many-flowered spikes of deep magenta-pink flowers. 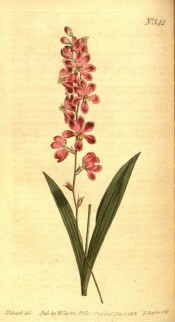 ‘This is certainly Linnaeus’s plant, and received its trivial name from a supposed resemblance to Scilla amoena, a proof that he described from a dried subject, in which state it certainly affords different ideas of resemblance, than when seen in a living one, especially in colour, which then becomes nearly violet; but is distinct from the I. scillaris of Thunberg, that being nearly allied to I. secunda. What is usually called scillaris by the Nurserymen is Ixia excisa, which resembles our plant in the leaf, but is a completely different species.’ [BM t.542/1801]. BM t.629/1803. Ixia scillaris was introduced to Britain in 1787 and I. retusa in 1793. [JD]. Listed in all published catalogues [B.285/1843]. In Macarthur’s possession as Ixia retusa and I. scillaris by 1843 as specimens of both were sent to William Macleay in that year. [MP A2948-3]. Ixia scillaris Mill. (1768) = Babiana stricta (Ait.) Ker-Gawl. Ixia scillaris Thunb. = Geissorhiza secunda Ker-Gawl.